HairMax Laser Combs Reviews: Do Laser Combs Really Work? ​Are you starting to notice that your hair is thinning? Do you feel that your hair is no longer as strong and healthy as it used to be? In this article we breakdown the best HairMax laser combs reviews to help you bring back your hair to what it used to be. It’s true that hair loss is part of life, but there is such a thing as too much hair loss. The good news is you can stop hair loss now before it gets worse. HairMax Laser Combs are by far the treatment regimen that’s completely side effect free compared to drugs like Minoxidil. These laser combs come with an expensive price tag. Knowing which ones give the best value for money is important to save time, effort and money. Read this HairMax Laser Combs review to know which one is worth trying for your own specific needs. This is an FDA approved hair growth stimulation device. It can work on both men and women but since it was one of the earlier HairMax Laser Combs models, it has older technology features that aren’t as good as the ones in the newer models. Despite that, this model is still a good choice for those wanting to try laser technology as a treatment for hair loss. The price is also a bit cheaper than the rest of the models in the series. This model features 12 lasers that deliver energizing light to the hair follicles. This means that you don’t have to focus your treatment areas as much and sessions are also shorter. It boasts clinically proven hair growth averaging to 129 strands per square inch of scalp. The expensive price is something to think about, though. The Prima 7 says less can be more. The 7 lasers can provide the same effect of 12 laser models, but you need more time per session. Hair growth may become more robust after repeatedly keeping up the treatment procedure for a period of time. The main downside is that you have to work it very slowly, moving half an inch at a time and pausing for a few seconds. This can get tedious, considering the entire treatment session lasts for 15 minutes. This model can revitalize dying and damaged hair follicles for renewed hair growth. This can help in reducing thinning hair and restore a fuller head of hair. This Laser Comb incorporates a breakthrough laser hair growth technology in an Italian innovative design. The comb has 12 lasers that reduce the number of passes and length of each treatment session. This product won’t tire your arms with each session. The LaserBand 82 has a hands-free operation that makes hair loss laser treatment so much easier. The cap is contoured for a comfortable fit during treatment sessions. The 82 lasers deliver balanced hair growth-stimulating light to the hair follicles. The comfort and convenience do come with an expensive tag price, though. This product features a revolutionary LLLT technology to deliver nourishing light to the hair follicles. The helmet contains a large number of lasers. Each helmet has 272 lasers delivering balanced light therapy to reduce hair thinning in both men and women. The light allows cells to undergo respiration processes that help them function better. This effect may improve hair growth, leading to a fuller head with stronger strands. There is a significant difference in hair growth before and after treatment with this laser helmet. This is the first product released in the HairMax Laser Combs series. The comb delivers laser light to the scalp, stimulating hair growth. Laser energizes the hair follicles as it passes over them during treatment. This laser comb has fewer points of laser light than many other laser combs on the market. It only has 7 lasers of medical grade quality. The manufacturer isn’t actively pushing this product in the same manner as the other models in the HairMax Laser Comb series. However, the HairMax 7 may still be a good product for beginners or people with mild hair loss. Those who want to see how HairMax laser combs works but unwilling to shell out big bucks for the newer hair laser comb models may opt to try this one first. Results are fairly middle ground. It may help in increasing fullness and density of hair. Clinical studies showed 93% of participants experienced new hair growth. This model is among the more expensive ones in the HairMax Laser Comb series. More than 90% of users reported restored hair growth. The average growth increase is 129 more hair strands per square inch. This product comes with additional medical grade lasers for greater coverage. The 12 lasers deliver plenty of growth energizing light directly to the hair follicles. Fewer passes over the scalp are required to stimulate hair follicles for renewed hair growth. This product is for those who are serious about preventing hair loss and regaining robust hair regrowth. The number of sessions required are significantly less compared to the first generation HairMax 7. That would mean spending more money for less time and effort in therapy. Results are typically experienced within 12 to 16 weeks. Use minimum 3 times per week, 8 minutes per session for maximum results. This model is by far the best value for money. It costs half of the Ultima 12, and has 7 medical grade lasers that deliver enough stimulation to the hair follicles. Just because a device has more lasers does not always mean greater results. The 7 lasers are maximized in terms of design to deliver the most stimuli possible to promote hair growth renewal. This product is recommended for those in the early stages of hair loss and can be used by both men and women. The 7 lasers are enough to cover smaller areas of hair loss. Those with greater surface areas of hair loss may do better with other models such as the Ultima 12. This is another one of the more expensive models of the HairMax Laser Comb series. This comb features 12 expertly designed medical grade lasers. These deliver energizing light over a wider area than other models. Each session lasts for 8 minutes. This laser hair comb model is a combination of new and state-of-the-art technology and comes in a new Italian iconic design. The technology incorporates clinically proven laser hair growth technology. This is one of the most innovative models among all hair growth laser devices. You won’t have to slowly comb your hair and pause every few inches to get the laser to penetrate the hair follicles. The HairMax LaserBand lets you sit back or continue with your daily activities while treating your hair loss. Just wear this band and let it revitalize your hair hands-free. The device is contoured to a cradle design. It also has a patented teeth design that parts the hair. 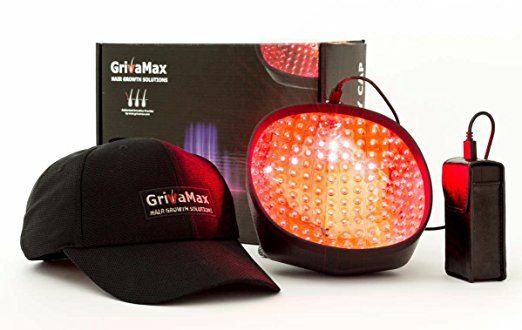 This ensures even greater delivery of the light therapy to the hair follicles. This device contains 82 medical grade lasers strategically placed all over the interior of the device. The distribution pattern of the laser within the device is designed well. There is another device making an innovative entry in the laser hair growth technology market. This comes in the form of a helmet design and is called the GrivaMax Laser Cap. This revolutionary design features an amazing 272 lasers. It incorporates advanced Low-Level Light Therapy (LLLT) technology. According to a 2014 study on LLLT technology and alopecia, this technology does appear to be safe and effective for hair growth. However, the optimal wave length and other properties have yet to be established. This type of therapy is recommended for both women and men and is so effective that it has the potential to not just rejuvenate hair follicles but also reverse hair loss. Treating the scalp with light therapy improves cellular respiration. This may help improve the function of the hair follicles. This may contribute to healthier hair growth, with stronger and fuller hair. In an extensive study conducted by Lexington International LLC, more than 90% of users of the HairMax laser devices experienced reduced hair thinning. In about 12 weeks to 25 weeks of continued use, hair becomes visibly fuller and strands stronger. HairMax Laser Comb series are backed by clinical studies that showed hair growth within a few weeks of use. The products in this series work by producing laser light that stimulates the hair follicles. As the laser comb passes over the scalp, laser penetrates the skin and reaches the hair follicles. The light is emitted through strategically placed lasers. These are medical grade lasers, which mean they are designed for therapeutic purposes. Our top pick is the HairMax LaserBand 82 along with HairMax Professional 12 LaserComb as a cheaper alternative. The number of lasers makes HairMax LaserBand 82 a very powerful device and HairMax is a trusted company with FDA approved technology. While Prima 7 is right that more isn’t always best, the 82 medical grade lasers inside the HairMax LaserBand 82 isn’t something to overlook. That large number of lasers is sure to cover every inch of your head. More hair follicles will be exposed to the nourishing and energizing laser light, resulting in new hair growth. Damaged hairs will also get more exposure, helping with faster recovery. The price, however, can be slightly too high for a lot of people. For people that prefer a cheaper device we recommend the HairMax Professional 12 LaserComb, which is an amazing entry model that will sure give you good results as well.